I can’t decide which is more impressive at Chicago’s Nightwood—the food or the woodwork. Seriously, I haven’t seen such impressive millwork since touring a Venetian palace last summer. From coffered ceilings to paneled walls in the bathrooms, this Pilsen restaurant not so subtly celebrates craftsmen—and that’s before you’ve even encountered the farm-centric menu and its celebration of food artisans both near and far. Thankfully, the same level of attention is paid to food and drink as was devoted to the restaurant’s design. Case in point: a stellar and thoughtful cocktail menu which shouldn’t be overlooked. For starters, the boozy American Beauty is made pretty by Hendricks gin, chartreuse, lemon and prosecco and the outstanding signature Old Fashioned is fueled by Bulleit bourbon, burnt orange syrup, brandied cherries and Wisconsin bitters. Starters and main courses reflect largely Midwestern foodstuffs and produce, with a smattering of ingredients from further afield. Perhaps the best dish on my first visit was the seemingly humble Iroquois cornmeal served with gruyere, olive oil, a poached egg, herbs & mizuna. An eccentric choice for the main ingredient of a dinner entrée, the little-known cornmeal has a story of its own which was told in a recent New York Times piece. Artisan cornmeal is hardly the only item on the menu worthy of attention, though. Friends and I also devoured deep fried Michigan smelts with green garlic mayonnaise—a dish that cured me of my ambivalence toward our local, freshwater version of sardines. And speaking of green garlic, ‘tis the season to savor this milder, less bitter version of my favorite allium. As long as green garlic is available, there’s no telling where it’ll pop up on the menu. But if the ephemeral item is there and you count it as a favorite, order whatever dish it’s in. Some other winning items?—Locally-sourced spit-roasted chicken with cornbread, dates, pecans and kale; Wisconsin trout, a mainstay at Lula, served with black beans, crème fraiche and pickled onions; and, Lake Superior whitefish with hominy, turnip greens, butter and herbs. 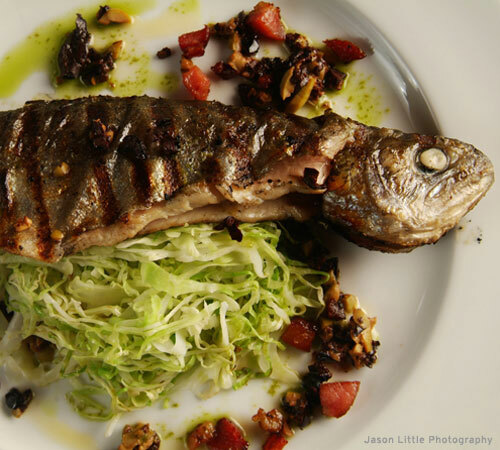 Not everything is local—shrimp and a few other seafood fly in from more distant destinations than neighboring states. But I haven’t tasted one dish that wasn’t well-executed and swirling with flavors. House-made pastas such as vermicelli with, um, green garlic pesto and duck liver cavatelli with bacon, escarole, olive oil and sheep’s cheese rocked my world, but will likely evolve into something different next week or next month. Food here is done so exceptionally well that skipping any course amounts to serious self-deprivation. Friends and I scarfed down a serving of caramel bread pudding with vanilla anglaise—the best version of this insipid, frequently dull dessert I think I’ve ever shoveled in my maw. In fact, each dessert I tried was a Lilliputian, lyrical masterpiece of flavor and pastry artistry. When designing the restaurant, co-owners Jason Hammel and Amalea Tshilds ensured it offered delights for our other senses, too. 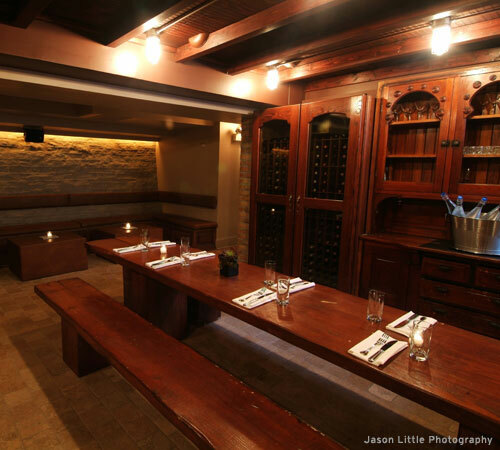 The cellar and its communal table channels a subterranean Tyrolean beer hall. And a slick, private patio with a fireplace for cool nights offers a tempting alternative to the smart, inviting rooms of the restaurant. Whether you eat indoors our out, though, you can count on well-executed dishes that bear the mark of chefs and servers that know what they’re doing. From innovative dishes to deeply grained and glowing wood paneling, Nightwood rocks.